Labor Day weekend is not my favorite time of the year. The extended weekend and numerous BBQ’s (solar or traditional) are nice. But the lingering sense of disappointment kills me — no more swimming pools, no more long summer nights, no more backyard gardening. Yes, even rocket scientists enjoy these things. ND SatCom Inc., a supplier of satellite-based broadband VSAT, broadcast, government and defense communication network and ground station solutions company, U.S. headquarters has moved into a Plano facility. The state-of-the-art, 23,000 square foot facility will house design, integration and testing of both fixed and mobile satellite earth terminals. "Today is a milestone in ND Sat-Com Inc.’s history. The more spacious office, customer training and integration facilities are an excellent foundation for the company’s future development in the America’s satellite communications industry and for servicing our customers more efficiently. The attractive package that the City of Plano offered us for this new business location supports us in our progress," said Chris Morris, president & CEO, Americas. 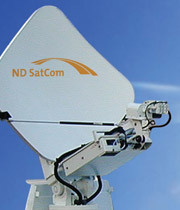 But ND SatCom’s services extend beyond Plano — well beyond Texas. Earlier this year, the company implemented Bulgaria’s first satellite-based telemedicine network. Of all the global sat providers, why did Bulgaria look to ND? Tzvetelina Dimitrova, CEO of Interactive Technologies, explains why the company chose ND SatCom for this specific project: "ND SatCom’s SkyWAN® is a platform which supports the wide range of applications such as video conferencing, IP video and VoIP needed in this project. Due to its allocation on demand scheme, SkyWAN® offers our end customer an optimized and dynamic bandwidth usage." Dieter Dreizler, Director Sales of ND SatCom, says: "ND SatCom’s SkyWAN® technology supports the network’s performance and offers unique redundancy features. Effectiveness and reliability are key factors in telemedicine communication. Given that parts of Bulgaria are earthquake endangered regions and terrestrial lines might fail, satellite communication is the best solution for providing independent and consistent telemedicine services." The Vietnam Telecom International Company (VTI) has set up the Vinasat Satellite Information Centre to manage and operate on-land satellite operating stations. The centre also will provide services related to Vinasat satellite. The first mission of this new centre is overseeing the installation of two satellite operating stations in Ha Tay province in the north and Binh Duong province in the south and training staffs to operate Vinasat satellite. Vinasat satellite will be launched by Lockheed Martin Corporation of the US while Canada’s Telesat is supervising the construction of the satellite. According to VTI, the launching of Vinasat is scheduled for March 28, 2008 at Kourou launching pad in French Guiana. Vinasat can cover Vietnam, Southeast Asia, China, North Korea, India, Japan and Australia. Once the satellite is launched, VTI will provide various services based on Vinasat such as private channel leasing, mobile broadcasting, DTH television, video conference, data transmission service for banks, etc. The satellite system will be based on Lockheed Martin’s award-winning A2100A spacecraft platform and represents the first satellite system ever procured by the nation of Vietnam. VINASAT-1, a C-/Ku-band hybrid satellite designed for a minimum service life of 15 years, will be located at orbital slot 132 degrees east. Under the terms of the delivery-in-orbit contract signed May 12, 2006 in Hanoi, Lockheed Martin Commercial Space Systems (LMCSS) will manage the project in its entirety, from satellite design and manufacturing to launch procurement arrangements, followed by final extensive in-orbit testing before customer acceptance. 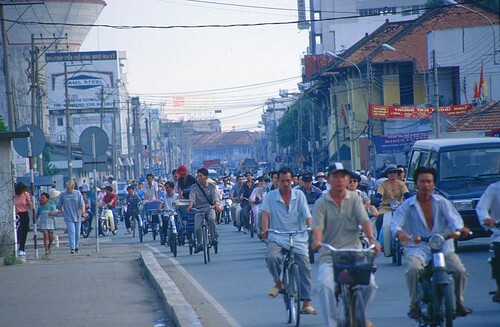 The satellite system is expected to improve telecommunications in Vietnam by transmitting radio, television and telephone communications to all corners of the country. VINASAT-1 also will improve the nation’s communication networks infrastructure by removing dependence on ground networks and allowing 100% of Vietnam’s rural communities and hamlets to be equipped with telephones and televisions. VNPT, the company paying for this bird, is expected to use it very effectively a "leapfrog" technology throughtout the country. Probably will increase competition in Asia, too. Two weeks ago the Perseids lit up the night sky, delighting astronomy buffs with a fireworks display of meteors. But what would happen if a true grand finale was coming our way in the form of an asteroid that could change life on Earth as we know it? That’s a question posed in the latest issue of Popular Science. There are between one and two million near-Earth objects (NEOs)—chunks of space rock whose orbits may pass within 30 million miles of Earth—that pose a significant impact threat to the planet. Of the 4,535 NEOs detected and tracked (704 of which are real whoppers), none are on a definite collision course, but there could be millions more, many of them potentially lethal, lurking in the cosmos. Who’s Watching? Most spotting is done by half a dozen optical telescopes in the U.S., Italy, Japan and Australia, coordinated by such programs as the Lincoln Near-Earth Asteroid Research (LINEAR) project, a NASA-funded collaboration between MIT’s Lincoln Laboratory and the U.S. Air Force tasked solely with the detection and cataloging of potential NEOs. Amateur astronomers worldwide also aid the effort. Collectively, the programs discover a new NEO every few days. What’s the Plan? Since 1998, NASA has funded Spaceguard, a consortium of observatories working to find 90 percent of the half-mile-plus NEOs by 2008; the group has found three quarters of the predicted 1,100 NEOs in this size class. Spaceguard’s next step is to find 90 percent of NEOs measuring 460 feet or larger—potentially up to 12,000 objects—by 2020, but funding has not been secured. Larger wide-field scopes should come online in Hawaii, Arizona and Chile in the next decade, greatly speeding detection. Vesta is a dry, differentiated object with a surface that shows signs of resurfacing. It resembles the rocky bodies of the inner solar system, including Earth. Ceres, by contrast, has a primitive surface containing water-bearing minerals, and may possess a weak atmosphere. It appears to have many similarities to the large icy moons of the outer solar system. The US team will arrive at Alice Springs and travel to Tennant Creek where they will establish a small temporary ground station. Tennant Creek was selected as it affords the best view of the crucial booster separation phase of the launch. As part of the same mission a United States Air Force NKC-135 aircraft will be operating out of Perth International Airport from mid-September and flying over northwest Australia. The launch from Cape Canaveral is planned for between 19 September and 15 October depending on weather and atmospheric conditions. If you’re more interested in dusk, as it were, be sure to check out Popular Science’s excellent slideshow of past asteroid collisions with our home planet. Last week, we told you about Google Sky, which is the Internet company’s effort to point the gaze of its incredibly successful Google Earth platform out into space. Google and NASA have worked next to and with each other for a number of years; I’ve never been bothered by this fact, and I’m not complaining now. 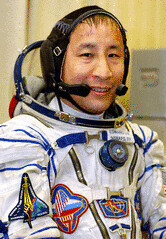 Yet the lines are getting even more blurred as former astronaut Ed Lu has gained a job with the search engine giant. “Lu, who has a doctorate in astrophysics from Stanford University and a strong background in the academic research environment, will have a lot to offer to GoogleSky as well as to GoogleScholar and GoogleBooks,” writes Loretta Whitesides in an article for Wired…. As WiredPro’s David Caverly points out, Google seems to be intent on covering its lunar bases. We have discussed the necessity of satellite broadband in remote regions and developing countries with weak infrastructures. That doesn’t bring to mind one of the most industrial countries on the planet—Germany. H3 Netservice will market ASTRA2Connect through retail partners to end consumers, reaching several thousands of affiliated outlets in Germany. H3 Netservice intends to offer ASTRA2Connect in three service packages. All the necessary hardware – a satellite dish with an interactive device, as well as a low-cost and easy-to-install modem – will be made available through H3 or retailers. ASTRA2Connect is a fully satellite-based solution for broadband access that delivers dual- and triple-play services without any terrestrial support. This purely satellite-based DSL infrastructure offers a unique possibility for regions without terrestrial broadband access to use high-speed DSL-internet. According to official data from the German Ministry of Economy and Technology, at least 2.9 million German households still do not have any access to Broadband internet. SES ASTRA is offering ASTRA2Connect on a wholesale basis to large service providers such as telecommunication operators, internet service providers and broadband operators across Europe who will market it to their respective end customers. ASTRA2Connect will help answer a question that remains in one of the most "connected" places on Earth—how do we bridge the European broadband gap? The European Union held a conference on this subject in May. Among the findings: while broadband penetration is growing, there still exists a "double gap" — between some countries in Europe and inside some countries (rural vs. urban). For more info, watch the video or read the powerpoint. As August draws to an end, watchers of the night sky will be in for a treat. In the early morning hours of August 28, sky watchers across much of the world can look on as the Moon crosses in to the shadow of the Earth, becoming completely immersed for one-hour and 30 minutes, a period of time much longer than most typical lunar eclipses. In fact, this eclipse will be the deepest and longest in 7 years. The event begins [began] 54 minutes past midnight PDT (3:54 a.m. EDT) on August 28. At first, there is little change. The outskirts of Earth’s shadow are as pale as the Moon itself; an onlooker might not even realize anything is happening. But as the Moon penetrates deeper in to the Earth’s shadow, a startling metamorphosis occurs. Around 2:52 a.m. PDT (5:52 a.m. EDT) the color of the Moon changes from moondust-gray to sunset-red. This is totality, and it lasts for almost 90 minutes. With the Sun blocked, you might expect utter darkness, but instead the ground at your feet appears to be aglow. Why? Look back up at Earth. The rim of the planet seems to be on fire. Around the Earth’s circumference you will witness every sunrise and sunset in the world—all at once. This incredible, colorful light beams into the heart of Earth’s shadow, transforming the Moon into a landscape of copper moondust and golden hills. The eclipse will be visible from Australia, parts of Asia and most of the Americas, but not from Africa or Europe. The view is different from each location on the planet. Here in the United States, Pacific observers are favored. For them the entire eclipse will unfold high in the post-midnight sky. However, on the East Coast, totality will be cut off early by sunrise. We’ve written before about plans to use satellite tracking technology to follow the progress of New York City Transit buses. No one seemed to complain about that idea, since being able to see exactly where the bus you’re waiting for is on its route is of undeniable benefit to the riders, and at worst makes no difference to a bus driver. The New York Taxi Workers Alliance — which accounts for more than 8,000 city drivers — is threatening to curb their cabs on Sept. 5 if the Taxi and Limousine Commission does not get rid of their GPS system, which the union says invades a driver’s privacy…. The issue over a driver’s privacy is the driving issue in the debate, with a driver’s location being tracked no matter where he or she goes. "The Taxi & Limousine Commission wants to spy on drivers and they want drivers to pay for it," argues Desai. Both sides agree the TLC uses satellite GPS technology to track everywhere a taxi cab goes and keeps a log of that information. The dispute is over how that information will be used and just who will have access to it. Mateo says it’s understandable that the taxis are fitted with the technology and adds it’s even advantageous to each driver. "It indicates where you’re located, you can see where you’re going," he says. But Desai says there is a different motive for the TLC to install the satellite. "They will use this information to decide on drivers’ incomes," she says. Sources within the TLC and individual taxi drivers tell CBS 2 that the GPS fears have nothing to do with privacy and everything to do with money. Many drivers fear the IRS will use the data to audit drivers and alert the INS about illegal immigrants driving cabs. Could this be the first strike ever started by GPS? Few space stories have captured the public’s imagination (and the press’ attention) more than the efforts of Virgin Galactic to bring the nascent space tourism business to the (well-heeled) masses via the Burt Rutan-designed SpaceShipTwo. While the attention is surely a boon to Virgin Galactic (and probably a source of resentment for its competitors), it can be problematic when things go wrong, as when an explosion at the factory of Scaled Composites (which made the first private trip into space with SpaceShipOne) killed three people in July during testing of a propellant system. It also offered insight into how two pioneering companies that forged an unlikely partnership two years ago to fly civilians to space reacted to the tragedy. In a reversal of roles, Richard Branson’s publicity-seeking Virgin Galactic kept a low profile while its usually silent partner, Rutan’s Scaled Composites LLC, took to the Internet to mourn its workers. While Virgin Galactic kept a low public profile after the accident, the company did reach out privately to reassure its "founding" customers, who have already paid $200,000 to be the first to go up in SpaceShipTwo, according to the AP report. Before the accident, hardly anything was known about Scaled’s progress on its suborbital spaceship program. Afterward, Rutan acknowledged for the first time the company was testing a propellent system for SpaceShipTwo, the successor to SpaceShipOne. Many details about the program are still unknown, including how far along Scaled is…. "Burt is taking it hard because it’s the first time he’s lost people. There is a feeling of shock that some of his friends died," said space business consultant Thomas Matula. The Personal Spaceflight Federation, made up of more than a dozen private space companies, has vowed to plow ahead despite the tragedy in Mojave, according to the article. What used to be just a science-fiction plot-line is quickly becoming reality. Wired profiles what it calls "The World’s Most Advanced Bionic Arm" — a new design by Johns Hopkins University’s Applied Physics Laboratory (APL). Jonathan Kuniholm’s right arm terminates in a carbon-fiber sleeve trailing cables connected to a PC. He has no right hand, unless you count the virtual one on a display in front of him. The CG hand, programmed to look like silvery stainless steel, moves through a sequence of motions: spherical grasp, cylindrical grasp, thumb to forefinger — all in response to signals from Kuniholm’s muscles picked up by electrodes in the sleeve. Mechanical engineers at Vanderbilt University are showing off a working prototype of a prosthetic arm whose "monopropellant rocket motor system" allows it to lift up to 25 pounds, more than three times as much as today’s prosthetic limbs. The device, whose research and design was funded by the Defense Department, runs on a miniature version of the same motor system used to maneuver the Space Shuttle in orbit; the system works by mixing a chemical catalyst with hydrogen peroxide, producing steam, which is then pushed through a series of valves to cause the arm to move. The researchers say their fuel system is superior to the traditional method of powering prostheses, batteries. Batteries are heavy relative to the power they produce; the rocket-powered arm, says Michael Goldfarb, the professor who led the team, produces more power with less weight than limbs that use other power sources. The prototype also produces more natural movement that conventional prosthetic arms. Instead of two joints — typical arms only move at the elbow and at the "claw" — the new device has fingers that can open and close independently of each other, and a wrist that twists and bends. One of their immediate concerns was protecting the wearer and others in close proximity from the heat generated by the device. They covered the hottest part, the catalyst pack, with a millimeter-thick coating of a special insulating plastic that reduced the surface temperature enough so it was safe to touch. The hot steam exhaust was also a problem, which they decided to handle in as natural a fashion as possible: by venting it through a porous cover, where it condenses and turns into water droplets. “The amount of water involved is about the same as a person would normally sweat from their arm in a warm day,” Goldfarb says. To allow for thermal expansion, the engineers replaced the arm’s nine valves with a set machined to a slightly lower tolerance, approximately 100 millionths of an inch. But when they began operating the rebuilt arm, they found that it hissed and leaked. At first, they thought that the arm had only a single leak, and spent several weeks trying to track it down. Finally, they realized that the noise and leakage were coming from all the valves. Replacing the high-precision valve set solved the problem. “We were astonished at by the difference between 50-millionths and 100-millionths: It made all the difference in the world,” says Goldfarb. Their biggest problem operating with hot gas turned out to be finding belt material that was strong enough and could withstand the high temperatures involved. They tried silk surgical sutures, but found that silk wasn’t strong enough. They tried nylon monofilament, which is stronger than steel, but it couldn’t take the heat. Finally, after a long process of trial and error, they found a material that works: the engineering thermoplastic polyether ether ketone. A video on the project is available here.